Trying something new out today and I hope you like it! I've always noticed other dietitians/bloggers (both non-diet and otherwise) sharing What I Ate Wednesday posts, and enjoy reading them (I'm nosy), especially non-diet dietitians who show a wide variety of tasty foods, along with commentary about what inspired their food choices. Diet culture has gotten us so far away from what a "normal" day of eating looks like, that I think it can be helpful to see someone incorporating both fun foods and fuel foods into their day, and eating amounts needed to fuel their body. BUT, I always hated the term "What" I Ate Wednesday, because I worried that even if it wasn't the intention, the emphasis might still be on WHAT they ate vs. WHY. Then I saw a post from @TheWellful on WHY I ate Wednesday and I had a moment of "duh, let's just call it that." Personally, I kinda love it, because I feel like it emphasizes the take-away of what I'd want you to get from these posts. Anyway, I hope you find this valuable! 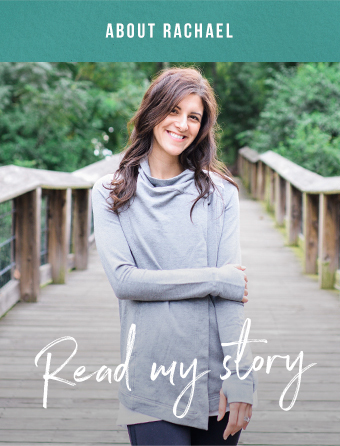 For the past couple years as my private practice has really grown, I've been looking for ways to keep this blog fresh and updated regularly for you, still putting out helpful content with less time. Recipe posts take a lot of work and so can more in depth Intuitive Eating/wellness posts, so hopefully this is something light that you all still learn from. I titled today's inaugural WIAW the Jetlagged Edition, because it was this Monday which was my first day back at work after coming home from Mallorca. Jetlag usually doesn't get me this bad, but coming home, I had a really early morning flight that we had to wake up 3:30 Friday morning for, then between long layovers and delays and a desperate need for a shower, I didn't get in bed till 1:30 am, which was 7:30 am Mallorca time. So basically I was up, save for a few 20 minute snoozes on the plane, for 28 hours straight on 4 hours of sleep. Oye. And when I'm tired, it definitely makes my appetite really funky. I feel like I go from being not hungry at all to "OMG I NEED FOOD NOW." Also after traveling, I feel like I always have really specific food cravings too, so after a week of ham and cheese tapas, I was really craving veggies. I was also craving things that were cool and creamy because...well, I don't know why, but I was! I worked the morning from home. I thought my first day back would be really hectic, but luckily I didn't get any consults at the IOP I contract at a couple times a month, so just had to teach class. And then my only in-person appointment had to reschedule, so I had a little more flexibility in my day. For breakfast, I had a couple toasted Nature's Path frozen chia plus waffles spread with an individual package of Rx Bars new nut butter they sent me and drizzled with a bit of maple syrup. Normally I might have some fruit and maybe even some type of dairy, like milk or yogurt with this meal, but I didn't have much of an appetite, and eating this made me feel a little overly full. I also had 2 1/2 cups of coffee that morning because I was struggling! I've been trying to keep it to one cup in the morning, because I really notice how coffee triggers my anxiety (and my tummy...), but y'all, coffee is liquid gold, and I really wanted the extra caffeine. I usually eat a snack around 10-10:30, but when I checked in on how I felt, I felt physically full. But then at like 10:45, it hit me that I felt really empty. See, even when you're pretty experienced with intuitive eating, sometimes your body still just does funky things! Normally I would have just stopped and had lunch, since I was feeling lunch hungry, but I was in the zone getting a project done, so I poured myself of chocolate milk to take off the edge. I don't think I've bought chocolate milk in like, 10 years, but it looked sooooo creamy and satisfying when I saw it at the grocery store the day before. For lunch I had leftovers from the night before. I almost always eat leftovers for lunch because it's easy. I typically make enough for four-ish servings so my husband and I have leftovers, but if I don't or we eat more, it's NBD. I'll just go out for lunch. The night before I had been really excited to get back in the kitchen after traveling, and doubly excited about getting some tasty veggies in, so I made this meal of salmon that I rubbed with harissa paste and baked in the oven (bleh, why did all that albumin come out??). I served it with sauteed carrots with olives and almonds, couscous I tossed with whatever random herbs I had in the fridge, and then made this AMAZE zucchini and walnut relish from this cookbook (hate the name, love the recipes). It's basically made from sauteed shredded zucchini mixed with yogurt, breadcrumbs, lemon juice, chopped walnuts, garlic and a bit of cayenne. I've been eating the leftovers with tortilla chips for a snack. After working the morning from home, I went to go teach my class at the adolescent intensive outpatient program I contract at. As someone who had pretty rough teenage years, I have SO much compassion for the teens I work with, and I've realized in the past year that they're kind of my favorite. After class, I came back to work from home, since my in person appointment had to reschedule so I just had a couple virtual clients. When I first came home, I felt taste hungry but not physically hungry, so I grabbed a handful of Boom Chicka Pop kettle corn, but then realized, nope, I'm actually physically hungry. So I ate a decent sized portion out of the bag while working on some emails on the couch. I usually eat snack foods out of the bag and stop when I'm satisfied, but if you're just starting to add in fear foods, it might be helpful for you to serve it in a bowl so it feels a little safer. I also made a cup of green tea because for some reason I was feeling kinda anxious - probably that jetlag again! After my session, I had to run to the grocery store to pick up a few things to photograph a dish for a sponsored post with Luvo. None of the snacks I had in the house sounded like what I wanted, even though we had a billion choices because I got sent a bunch of stuff when I was out of town, and I had just gone grocery shopping. When I'm tired, I get picky. Something cool and creamy sounded just right, so I grabbed this Forager smoothie and these parmesan crisps that were on sale. I had about half the smoothie and a handful of crisps, then had the other half of the smoothie before my 6:15 RD career coaching call. For dinner I had this easy dish made by stir frying a Luvo frozen meal with veggies and an egg. It was perfect because it took like 10 minutes to make, so I cooked and photographed it before my call, then warmed it up and ate after the appointment ended. For dessert, I had some ice cream outside on the hammock. I had to take a picture for a sponsored social media post with NadaMoo, but I was also craving something cool and creamy too, so it was perfect timing, and a super enjoyable way to relax outside after wrapping up the day. Anyway, I hope this post has been helpful for you! Again, this is just an example of one day of eating - sometimes it's more, sometimes it's less! But I hope this gives you some insight into what Intuitive Eating looks like in action.